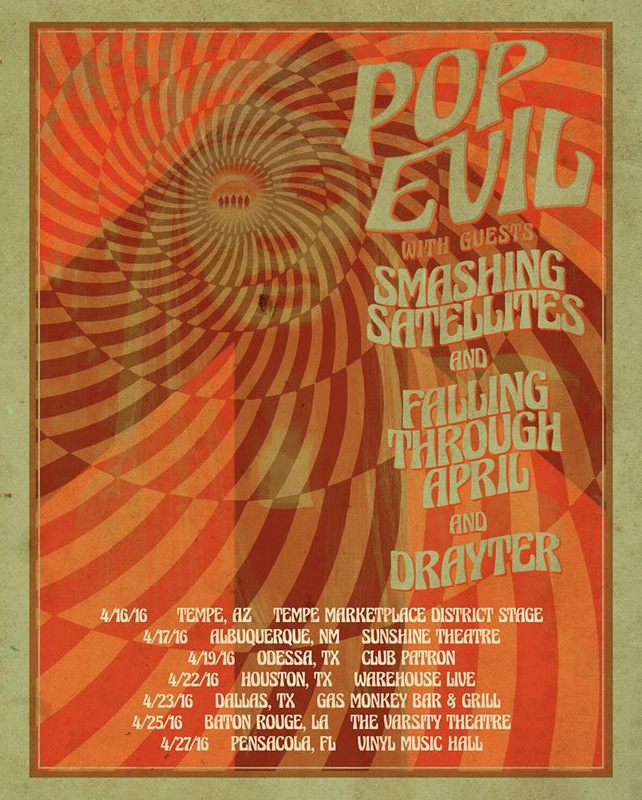 POP EVIL have announced a handful of new tour dates this week continuing their blitzkrieg in North America in support of their latest album UP. 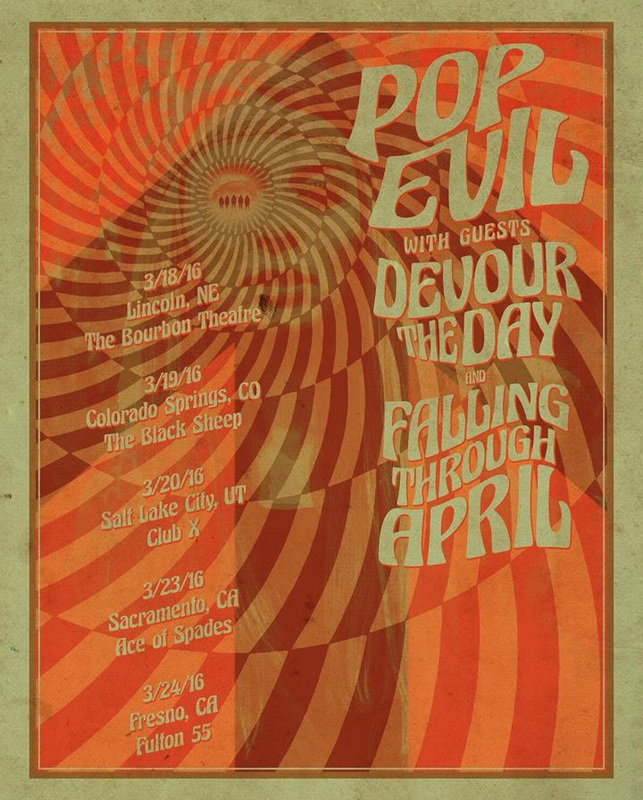 The band will be heading back on the road mid March on batch of headline dates with special guests DEVOUR THE DAY. Kicking off in Lincoln, NE at The Bourbon Theater, that will take them out to Fresno, CA on March 24th wrapping things up at Fulton 55. 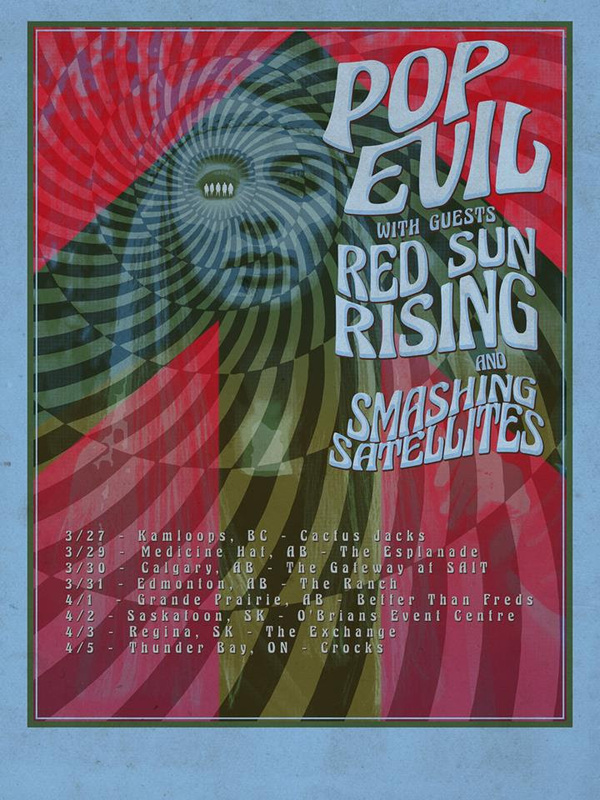 The band will then head north to CANADA to embark on a week of dates with guests RED SUN RISINGand SMASHING SATELLITES that will bring the band from Kamloops, BC all the way to Thunder Bay, ON. Next, the band will come back to The States for a stint down south before two key performances atWELCOME TO ROCKVILLE and FORT ROCK. 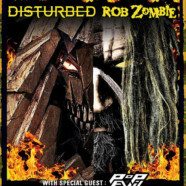 Finally, the band will then head straight out with ROB ZOMBIE and DISTURBED on a month long trek with highlighted stops at ROCK ON THE RANGE, CAROLINA REBELLION and ROCK FEST. 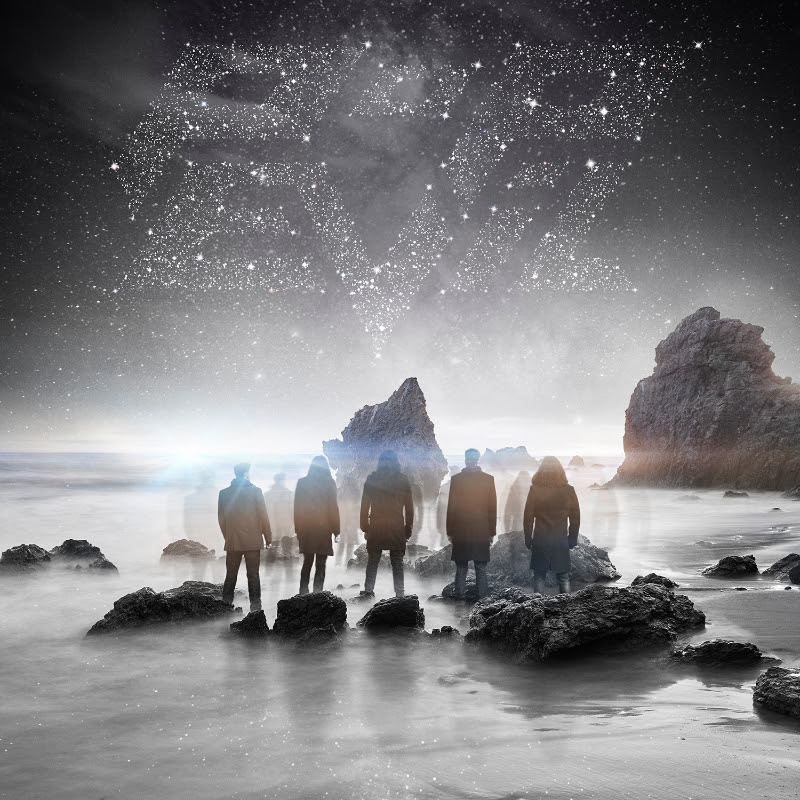 POP EVIL’s smash hit “Footsteps” was just nominated for an iHeartRadio Award in the Rock Song of the Year category. 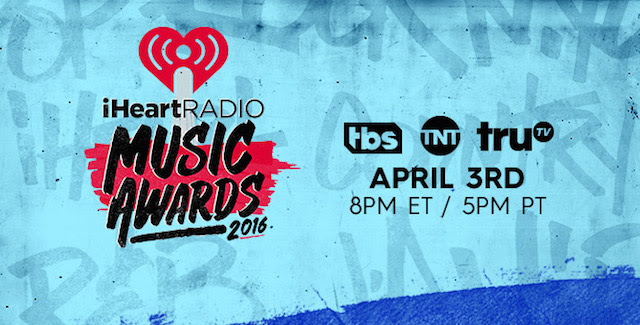 The third annual iHeartRadio Music Awards is set to air Sunday April 3, 2016 via Turner Entertainment’s TBS, TNT and truTV networks. Click here for a full list of the 2016 nominees. The band also won an award for peer voted “Best Independent Artist” at this year’s Radio Contraband Awards. The award is a big accomplishment for a band who are vocal and proud to be on an indie label. 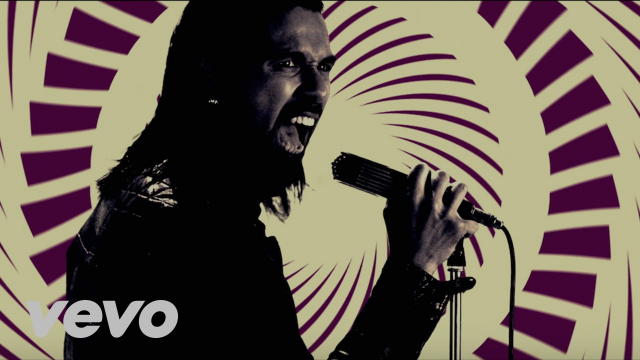 POP EVIL recently debuted their new music video for their track “Ways To Get High,” which is currently approaching NUMBER ONE at Rock Radio. The band reached #1 on the Mainstream Rock Chart for the fourth time in the band’s career with their latest smash hit “Footsteps” and stayed there for a staggering 4 weeks last year. The single was not only the fastest charting single the band has to date, but was also the fastest independent record label single to go #1 at rock radio last year. 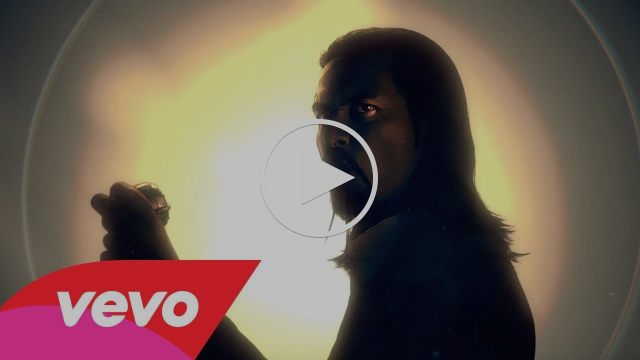 POP EVIL released UP on August 21, 2015 and saw the release land at #1 on the Billboard Indie Chart in the week of its release. The LP pulled in at #25 Billboard Top 200, #16 Overall and #3 Top Hard Music albums. UP was released with some serious critical accolades. Blabbermouth called it “an album that will rock the socks (and other clothes, no doubt) off their fans.” Huffington Post said the new LP “finds the Michigan band is in fine form.” News powerhouse USA Today even recognized that Pop Evil have“become a familiar presence on rock radio” in a recent feature with vocalist Leigh Kakaty. POP EVILreleased a flurry of tracks off their LP before its release. “Footsteps” led the charge with “In Disarray,” “Dead In The Water” and “Ghost Of Muskegon” right behind it.